You be the scientist! 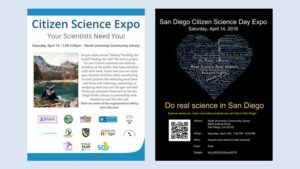 There are over 20 research projects in San Diego in need of volunteers. No science background needed to help. Do science while hiking, fishing, surfing, reading, and more. Check out the San Diego Citizen Science Expo at the North University Library on Saturday, April 14th from 1 PM-5 PM to learn more.